After a LONG winter, it’s finally SPRING! We’re sharing a few of our must-have local self-care products including skincare, fashion, candles, and even a couple sweet treats for you (and your pup)! Moderncity + Main’s Spring Collection is out and it’s absolutely scrumptious! Fragrances include: Georgia Peach (peach, lily, musk); Magnolia Blossom (magnolia, apple, sandalwood); Tomato Leaf (basil, tomato, sage); Lightning Bugs (bergamot, bamboo, violet); In Bloom (honeysuckle, jasmine); Coconut Lime (bergamot, lime, coconut); Sand + Surf (jasmine, orange, cedar); and Linens on the Line (bergamot, rose, sandalwood). We’re gravitating toward In Bloom, whose fragrance contains notes of honeysuckle and warm jasmine. We love a good romper, and local boutique Nicole J has several to choose from! The Madison (pictured here) is the perfect in between season option for fluctuating spring temps with its skirt overlay. Oh, and want the whole look? She sells shoes and accessories, too! Their daily menu includes a wide range of freshly baked gourmet cupcakes and cake pops. New flavors on their Spring Menu include Lemon Poppyseed, Strawberry Pretzel Salad, Berry Cheesecake, and Cherry Cobbler. Yum!!! And that’s not all… they also make doughnuts for dogs!!! Pups deserve self-care, too, so grab your pooch a sweet spring treat, too! And follow Half-Baked over on Facebook and Instagram for all their latest treats. Springtime equals exposed arms and legs. And for some of us, that means revealing ghostly, pale skin that would rival Casper’s! Yikes! Fortunately, there’s a safe way to get a bronze glow: an airbrush spray tan from Walkin On Sunshine. Choose from a variety of packages. Now that you have glowy skin, keep that skin healthy by applying SPF 30. We love Sorella Apothecary’s Tropical Topical Matte SPF 30, or Quench & Protect Hydrating SPF 30. Available at both La Belle Studio locations. Give us a call at 302-656-0555 or 302-378-8880 to schedule your microblading consultation. Decision fatigue, especially when it comes to products, is a real thing. So many product options can easily overwhelm you, especially when you’re faced with “Should I save or splurge?” Here are a few beauty products WORTH THE SPLURGE! For sweatproof, waterproof, and transfer-proof coverage, Cover FX has you covered (pun intended). Their foundation and concealer are vegan, cruelty-free, and free of talc, oil, fragrance, parabens, and gluten. And with over 30 inclusive shades, you’re sure to find the perfect match. This jelly texture primer visibly firms for a smoother complexion while gripping makeup for optimal all-day wear. Added bonus: anti-aging benefits from an ocean derived complex that targets fine lines and improves skin clarity. Love the look of a matte lip stain but hate the dried out feeling? 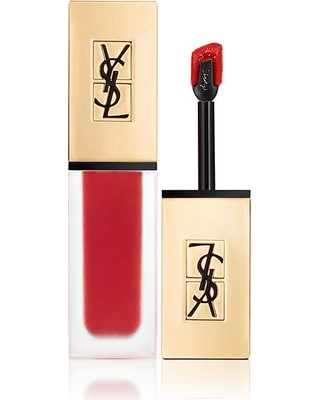 YSL’s formula gives lips a matte tattoo-like color that is non-drying. With up to eight hours of wear, your lips will stay looking fresh and feeling good, too! If you’re looking to boost texture, this dry spray builds volume and texture. Plus it absorbs oil at the roots, enabling your blowout to last even longer! LOVE! This product is the BEST for damage repair. It saved my life a couple years ago after my hair completely fried off. My hair stylist told me to use this product regularly, once a week, and within a month and a half, my hair was completely revived. It was unbelievable! Pureology Colour Fanatic Multi-Tasking Hair Beautifier. This leave-in treatment is recommended by many La Belle employees! It provides 21 unique benefits to prime, protect and perfect color treated hair. Founded by sisters Laura and Emily Schubert, alongside Lillian Tung, this product line offers 100% natural options devoid of artificial fragrances and dyes for minimizing ingrown hairs, irritation, and stubble. Fresh Rice Sake Bath. Detoxify, soften, and even skin tone with this soothing purifying sake bath. Features an infusion of fruit and 38% real sake. It smells amazing and gives your skin a nice glow. Iris Hantverk Bath and Body Brushes. Made from natural materials, these hand-made Swedish bath and body brushes are as durable as they are gentle. Brush collections include hair, body, and face. Ready to splurge on stunning lashes, fresh skin, or full brows? Give us a call at 302-656-0555 or 302-378-8880 to book your service.